A light-hearted comical interpretation of the fable, in which a Solider (T.) is hungry and lost, but with the help of children and Mayor (A. ), he convinces the Vegetable Lady (S.) and Butcher (B.) to contribute food to his soup. 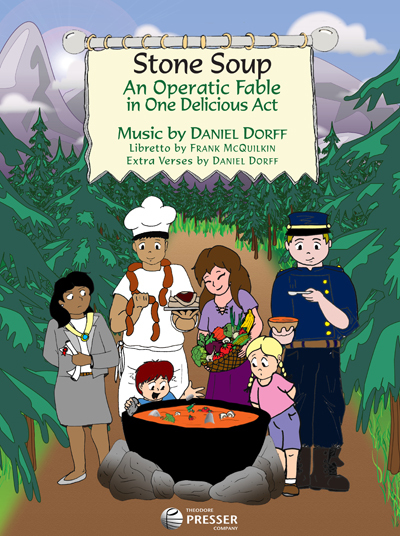 The musical refrain "It Takes All Kinds of People to Make Up a Happy Town" is echoed by the story's use of all kinds of food to make the most delicious Stone Soup, and to celebrate community and diversity. - COMMISSIONED by Young Audiences' Philadelphia chapter for ongoing in-school use since 1983. - OVER 1000 PERFORMANCES! Continuous run for 20 seasons. 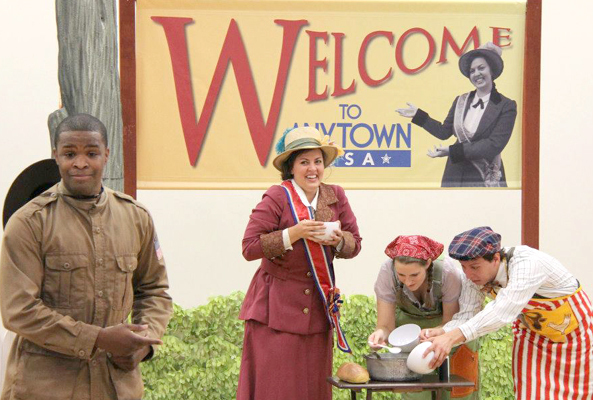 - Atlanta Opera: 22 performances October-November 2012, more scheduled for 2013. - PUBLISHED by Theodore Presser Company (411-41126 vocal score), orchestration on rental. - PUBLISHED by Theodore Presser Company (312-41580). "adds a further example to the growing body of Alleluias to emerge from American organ lofts." - Music Teacher (UK) (Bannan), July 1991. Recommended in The American Organist by Philip Brunelle, November 1991. Poem by Catullus, in translation. PUBLISHED by Theodore Presser Company (312-41406). - PUBLISHED by Elkan-Vogel (362-03404). - ALSO AVAILABLE for Voice with Brass Quintet. Poem by Gerard Manley Hopkins. Frank Bonanno conducting, May 19, 1985. - PUBLISHED by Theodore Presser Company (312-41725). Poem from Carmina Burana, in translation. - COMPOSED for and PREMIERED at Cornell University 1978 Commencement ceremony. 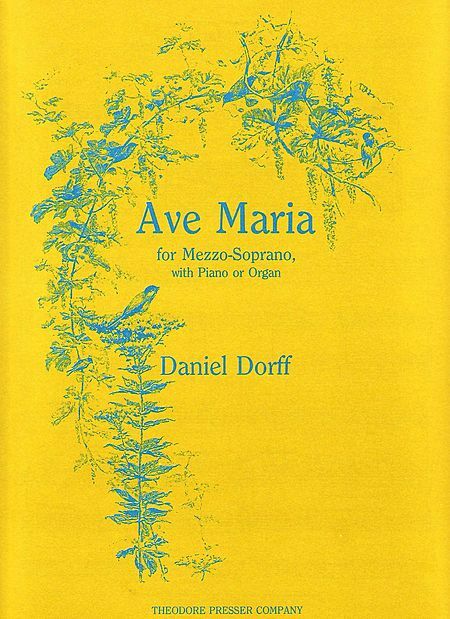 - COMMISSIONED and PREMIERED by the Ithaca College School of Music, Nov. 2003. - PUBLISHED by Theodore Presser Company (312-41836). Poem by Mary Frances Wack. - PREMIERED by Jeannie Clark Fisher and Clifford Earle, Ithaca, Spring 1978. - PREMIERED by Christina Lynn, Philadelphia, July 1980. - PUBLISHED (ensemble version) by Theodore Presser Company (111-40104P). - PUBLISHED (keyboard version) by Theodore Presser Company (111-40104). - PREMIERED by Diane Rama, New York, 1974. - PUBLISHED by Theodore Presser Company (111-40178). - RECORDED on Capstone Records by Helene Williams and Leonard Lehrman. Poems from Carmina Burana, in translation. Poem by Eri Takahira; title means "From the bottom of my heart" (Japanese). - PUBLISHED by Tenuto Publications(Presser 491-00647). Cantata on Tamil love poems, translated by A.K. Ramanujan. - PREMIERED by Candace Sassaman and Mary Murphy, University of Pennsylvania, September 29, 1979. - PREMIERED by Christina Lynn, Deborah Wong (Flute), and James Primosch, Philadelphia, October 23, 1982. - PERFORMANCES include October 1999 Derriere Garde festival in San Francisco. - PREMIERED by Jody Applebaum and Marc-André Hamelin, through Network for New Music, Phila., February 3, 1985. Poems by Catullus, in translation. - PREMIERED by Mimmi Fulmer and Jeffrey Rehbach, conducted by Duane Heller, at Cornell University, Winter 1978. Poem by Eiko Fan; title means "To be able to fly" (Japanese). - PREMIERED by Janis Sabatino Hills, soprano, and Jane Leslie, piano, Commack, NY, October 22, 1998. - COMPOSED for and PREMIERED at the Orchestra 2001 AIDS Quilt concert, May 26, 1996, Philadelphia; Kevin McDowell, Baritone, Lori Barnet, Cello. Texts by the composer, with the words in alphabetical order. - PREMIERED by Helene Williams and Leonard Lehrman, August 20, 1999; Roslyn, NY. - Second song premiered November 11, 1995 by Manuela Ochakowski, soprano, and Johannes Harneit, piano, and subsequently broadcast across Europe, as a winner of the Neue Musik in Delmenhorst competition. Cantata on poems by the composer and Mary Frances Wack, and translations of Ausonius and Paulinus. Poem by the composer about the comforting beauty of snow, translated into Japanese by Eiko Fan Takahira. 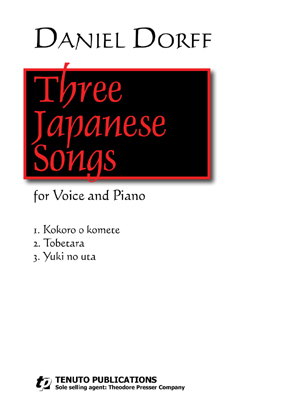 - PREMIERED by Yukiko Ishida May 25, 2000 in Suntory Hall, Tokyo.